Uglyworld #1801 - Goods While They Lastereds - (Project Cinko Time - Image 10-365), a photo by www.bazpics.com on Flickr. 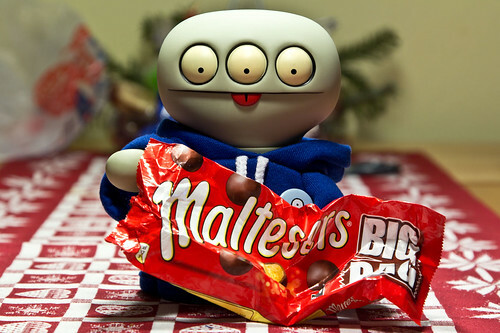 Last night I showereds you some of my chocolaters and cookie scorerings from the Uniteds Kingdomer, but what I didn't lets you casts your eyeballers on was this biggers bagger of Malteserers, and with very good reasons too! You sees, Baz has what I can only calls a Malteserers addictioner, so I knew if he even catchereds the smallerests of whiffers that I had a packeter in my possessions then they would mosts likely does a dissamappearings act in no times at all! Thankfullies I managereds to keeps them all to myselfs, and now that the packeter is completelies scoffered I is lefts with only the thoughts that they was goods while the lastereds...hopefullies I can gets another packeter soons!